James “Jim” Michael Ibach, 74 of Olathe, KS passed Wed. July 20, 2016. Jim was born March 31, 1942 in Arkansas City, KS to Paul and Ethel Ibach. He graduated from Arkansas City High School in 1960, before attending Arkansas City Junior College and William Jewell College in Kansas City, MO where he was awarded track and baseball scholarships. He married his high school sweetheart Carolyn Ann Hawkins July 25, 1964. Jim loved sports, he grew up in American Legion ball, and played semi pro baseball out of Wichita. He had the opportunity to sign pro with the Phillies in 1963 but chose not to. He also enjoyed playing basketball and track when he was in high school, and he ran track at Arkansas City Junior College and played baseball at William Jewell. He worked for Retail Credit in Wichita and Pratt, KS from 1964 to 1965, before being drafted in 1966. 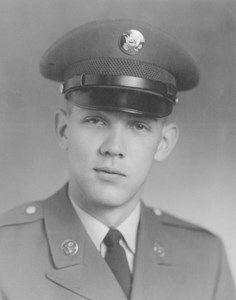 He served in the US Army from 1966-1968. In 1968 he went to work for State Farm Insurance and lived in Wichita, Chanute, and eventually Olathe in 1983. He retired in 2004 after 38 years. In his retirement he enjoyed golf, hunting, fishing trips to Canada with friends, motorcycles, and time with his family. He loved watching his grandson Max excel in sports like baseball and track as he did. He was preceded in death by his siblings Eleanor Wilton, Marjorie Alberding, Douglas Ibach and Byron Caskey. He is survived by his wife of almost 52 years Carolyn of the home, their children Lorette Brunner and husband David of Olathe, KS and Leann Perry and husband Troy of Osawatomie, KS and his grandson Max Cameron Perry. He is also survived by his sister Paula Plush of Arkansas City, KS as well as several nieces and nephews. In lieu of flowers donations can be made to First Baptist Church of Olathe or Hospice House of Olathe Medical Center. Add your memories to the guest book of James Ibach. We are so very sad for the loss of your beloved Jim. He was a big man with a big heart. He was kind and funny and was always quick to help out anyone in need. He loved his family and friends deeply and that deep love was returned to him. He is out of pain now and at peace in the loving care of our Lord. I hope knowing that brings you peace too. Our deepest sympathy to you and your whole family. Jim was a neighbor to my mom and stepdad- and they shared a garden. Their backyards touched therefore our lives are connected through the garden- peppers have been grown , tomatoes have lived ,dogs have been buried. Jim was the neighbor who always came over to check out what was up .- my folks always cared for him deeply and he would always come over to say hi and watch my children grow- he was kind. I will miss him. So sorry for your loss, thoughts and prays to the Ibach family. My prayers to the family, I enjoyed Jim's friendship and business for many years. I was Jim's barber and enjoyed talking to him and hearing his stories. I will miss him, my condolences to all his friends and family. Jim was a dear childhood friend, one of my favorites. Carolyn, we are so sorry to hear of Jim's passing. I remember he hired me at State Farm Insurance in Chanute, Kansas and it was such a pleasure to work for him. He will be missed greatly. May God bless you and your family at this sad time. I will miss you. We did a lot together! We built decks, bookcases, planted trees. finsihed basements, etc. and watched each others house when the other was out of town. We mowed our lawns at the same time so we could have a 'refreshment' together afterwords on the curb. We solved a lot of world problems in those discussions. We also had breakfast together almost every Sunday for the last 20 years. I will miss you my friend. I am really sorry to hear of Jim's passing. I was a superintendent at State Farm with Jim. We opened the State Farm Corporate Woods Claim office together in 1983 or 84. We worked together until early 1985. Jim was quite a fellow and character to work with at State Farm. Jim was fun, challenging, strong willed and never, never ever boring to be around. With Jim you were never in doubt what he thought or his opinion. We often had lunch together trying the many barbecue restaurants in the area. I remember many Jim stories fondly. He was often a thoughtful compassionate supervisor for his folks. Almost everyday Jim would come in to my office and say "you want a werthers"...he always carried them in his pocket. My condolences to you in the loss of Jim. My prayers are with you and your family during his loss. May his presence live on forever in your heart. I will never forget "Ibach" because he believed in me and gave me first opportunity at State Farm and 27 years later, I am still here at State Farm. Many blessings and I will continue to keep you all in my thoughts and prayers. In my 37 year career, Jim was by far one of the most impactful bosses I ever had. He was also a very loyal peer and friend. He was so passionate about his work, taking care of customers, helping his employees, and allowing us to have a bit of fun while making sure we got things right. And it was clear how much he loved his family. He knew so much about so many things! I will always be grateful for having had him in my life, and having learned from him. My heart goes out to his family and all who knew him, as there will never be another. He broke the mold. May God comfort you all. Carolyn, I am so sorry to hear of Jim's death. My heart goes out to you. I am praying that God will be very close to you and I know He will be with you at this time. I remember Jim helping you bring in your items for the bazaar and the helping us with set up and the signs he made for you. I remember him working the year we cooked all the chickens! He was always fun visit to with and so kind.